The West Maui Greenway is a proposed 25-mile, multi-use trail that uses and transforms the abandoned cane haul road into a recreational ribbon connecting residents and visitors alike to the outdoors and community destinations. The trail is intended to provide a safe and family friendly place to enjoy the outdoors away from the heavy traffic on Honoapiilani Highway and connect communities and destinations, while offering alternative transportation. 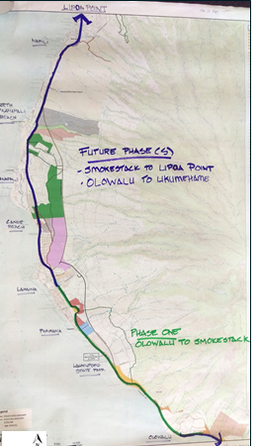 The goal is to construct the trail in phases from Ukumehame to Lipoa Point, with Phase I running parallel to the Sugar Cane Train tracks from Ka'anapali to Lahaina. The mission of the proposed West Maui Greenway is to create a pedestrian/ bicycle friendly community – one that encourages residents and visitors to take fewer car trips and to live a more active and healthy lifestyle while also providing cultural and recreational experiences for the community. The Island of Maui's railroad history dates back to 1890 when the island's large Pioneer Mill Company, a sugar cane plantation, built a short railroad to better move sugar cane from fields to the mill. The railroad lasted until around 1950 when trucking and mechanical farm machinery became more cost effective than railroads. However, the railroad did not disappear. In 1969 A.W. "Mac" McKelvey partnered with the Makai Corporation and began the Lahaina-Kaanapali & Pacific Railroad, better known as the Sugar Cane Train, as a tourist attraction. The railroad has become extremely popular over the last 39 years and currently operates six miles of track. Cane haul roads criss-cross the plains surrounding the West Maui Mountains from Ukumehame to Kapalua. These roads serviced the plantations but as each field was shut down, the roads were no longer used. This presented an opportunity for sections of the cane haul roads, running parallel to the Honoapiilani Highway, to be used for an emergency alternate route in the event of road closures. Currently, the plans for the proposed West Maui Greenway utilize some of these abandoned cane haul roads for significant portions of the proposed route. *The original plan was to construct Phase I from Olawalu to Lahaina. Due to challenges, it has since been rerouted from the Kaanapali Sugar Cane Station to Lahaina.